The system is designed to operate as an independent unit by only one operator or as part of an automated production line. 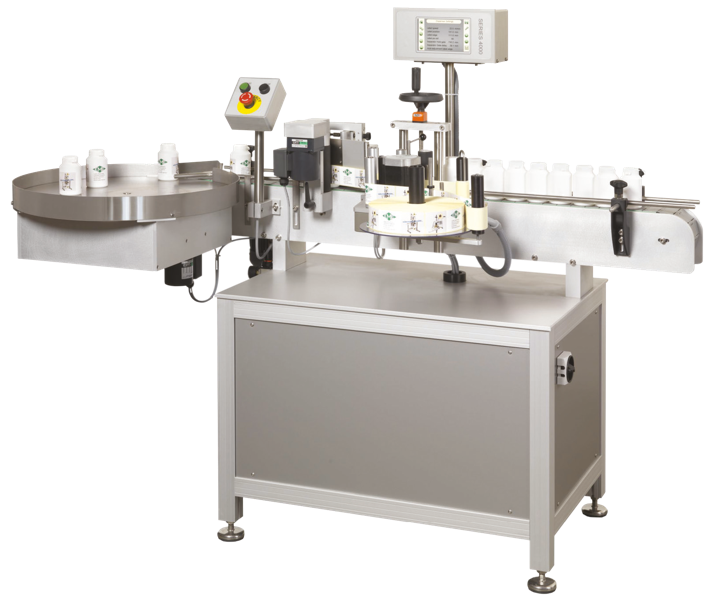 Straight sided, cylindrical containers are placed on the infeed table and automatically fed along the conveyor to the TRI-ROLLER labelling unit. After labels are are applied, containers collated on outfeed rotary table. Design of the TRI-ROLLER labeller allows transfer of containers from rotary to other conveyors. Labelling Speeds. 40 to 70 ppm dependant of size of product and label. The TRI-ROLLER system can be mounted on a stainless steel cabinet base housing all controls and has a capacity of between 30 to 70ppm. Rotary tables: 600mm & 900mm diameter in-feed tables with optional product separators & bottle dividers 600mm to 1500mm Out-feed tables available to suit any product. For edge to edge and labelling of round containers in registers.